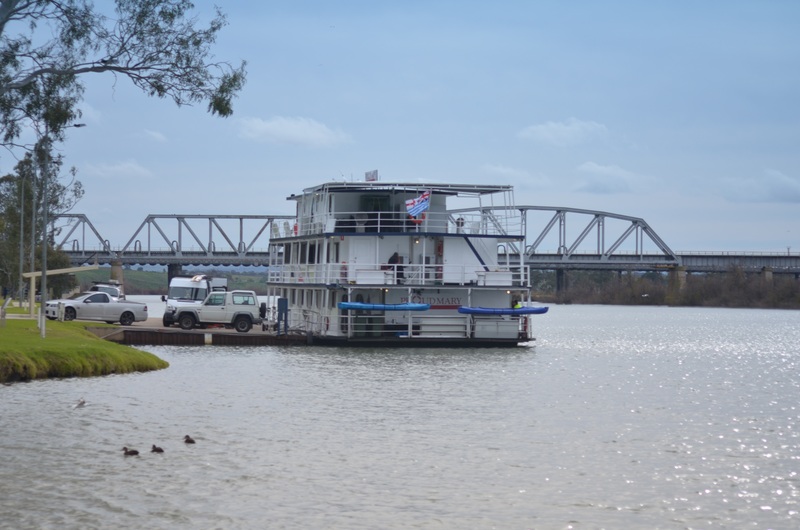 Murray Bridge is located 76 kms east-south-east of Adelaide. 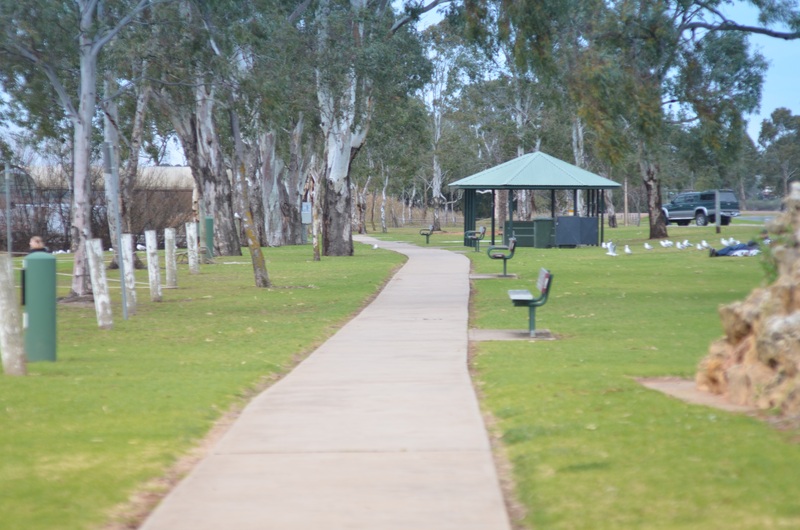 Sturt Reserve runs along the river-front and some metres inland, offering walks along the rivers edge, safe grassed playing areas for children, a fenced area with built in playground equipment and a skate park. The reserve is an ideal place for a family outing, as it also offers public toilets and barbecue facilities. If you do not feel like bringing your own food for a picnic, the nearby community club offers special meals starting from $10. Sturt Reserve also offers a view of one of the two main bridges at Murray Bridge. When you drive over the bridge, the view is spectacular, but only lasts a few minutes because you are obliged to keep going for safety of other traffic. Sturt Reserve offers parking where you can get out and view the bridge from below. Walking along the river front allows the keen photographer to capture the bridge from several angles. According to the Murray Bridge Council website, functions and sporting events can be held at the reserve if booked through the council contact officer. Council sponsored events held at the reserve include the the International Pedal Prix in September, the Wooden Boat Regatta in October and annual Murray Bridge Christmas Pageant. Houseboat mooring is available upon application and the Ngarrindjeri carved houseboat mooring bollards at Sturt Reserve are listed on the council web-site as outdoor works of "art". A major attraction at Sturt Reserve is the animated model of a bunyip. The bunyip lurks in a pool in a custom built shelter on the river bank. If you feed it a dollar coin, it will raise it's ugly head out of the water, reach toward you with its arms and open its huge mouth. The accompanying sign explains the legend of the bunyip. A local Aboriginal legend taught children that the bunyip would rise out of the water to frighten them. The white settlers heard the tales and early explorers strived to locate a real bunyip. Belief in the bunyip declined as more of Australia became settled. The sign associates the bunyip with the Diprotadon. The Diprotadon is part of Australia's extinct mega-fauna. It is a land animal and a marsupial, something like a huge wombat. While it is huge, according to the Australian Museum website, it was a vegetarian. I have always admired the diprotodon skeleton in the museum and have never felt the sense of terror that the bunyip was supposed to arouse. The crocodile-like mouth and curved clawed hands reaching towards me from the Sturt Reserve bunyip did not seem anything like the diprotodon skeletons I had seen. The two front teeth should be prominent and hooked over so the outh seemed ideal for cropping vegetation and the feet should be solidly placed upon the ground to support the huge body. It is my belief that the bunyip was never a real creature or part of the Australian mega-fauna. It is likely that the bunyip was to Australian Indigenous mythology as the troll and ogre were to European mythology. These are ugly giant creatures (often portrayed as green like this bunyip model) that roam at night and eat children. They may be a danger to adults too, but seem especially fond of child-flesh. These mythical creatures are the embodiment of our fear of the dark and the unknown. They may be featured in tales told by parents to their children to encourage then to stay safely inside at night. As the bunyip is associated with rivers and lagoons, the tales could have been told to children to keep those who could not swim a safe distance up the bank. 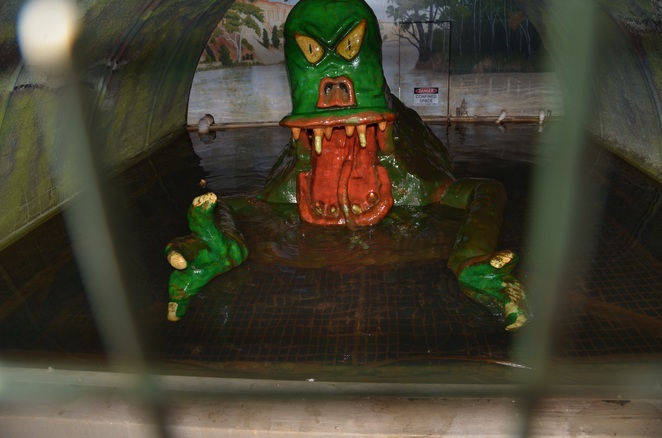 The bunyip at Sturt Reserve is clearly a fake, a model created to amuse children. However, the pictures of the habitat painted onto its shelter are well worth observing. 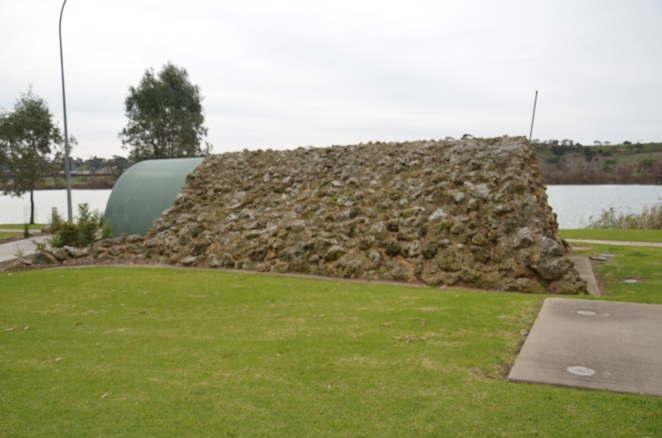 Moreover, if your interest has been caught, why not visit more sites in Australia associated with the bunyip? Bunyips have been sighted by picnicers in the 1800s at Bold Park near Perth in Western Australia, and they also appeared in 1883 to shearers picnicking near White Cliffs, Koolunga in South Australia. According to the legend the Three Sisters (huge rocky formations in the blue mountains near Katoomba) are actually girls whose father turned into stone to disguise them from the Bunyip. A supposed bunyip skull was found on the banks of the Murrumbidgee River in NSW.